t wouldn’t be unreasonable to suggest many of us share too much these days. You can’t get out of bed without knowing what Dave had for breakfast or knowing that your brother’s ex-girlfriend’s friend is at the airport with her cat Sooty. Didn’t you have that awkward blind date once? Anyway, we paste our lives all over the internet, but there’s a more valuable way to spend our time and words. In fact, it’s a pastime many would employ. We need to talk about everyday journals for men. For the younger male readers, journaling may be as foreign to you as floppy disks, slide rulers, or the dreaded gym class rope climb. Don’t worry, we’ll catch you up. Many men of different ages are starting to use their journals again for a variety of reasons. Everyday journals for men are perfect for backpackers wanting to remember every detail of their trip. They’re also great for memorizing anecdotes for the ladies they meet in old taverns on weeknights. Yet, they’re also ideal for businessmen who are sick of their desks being illuminated by bright green Post-it notes. These are the polar ends of guys who are turning back to the traditional journal and every man can surely benefit. Everyday journals for men have fallen off our radar until this latest resurgence. That is why we’ve put together a handy post to give you all the journaling information you need. On top of this, we’ll give you the lowdown on the best 16 journals for men out there at the moment. What Are The Benefits Of Writing a Journal or Diary? There are more benefits to keeping a daily journal or diary than simply remembering your anniversary and your mother-in-law’s birthdays. Avoiding an early morning dart for gas station flowers and chocolates is always welcome. However, there’s a bit more to journaling than meets the eye. In fact, when the Men’s Gear researchers sat down to work, we found so many benefits that we could have easily made a whole post about them alone. One of the most documented reasons to start journaling is the mental benefits it can offer. There’s plenty of psychological evidence that proves everyday journals for men can be useful. Keeping a record of their schedule, daily activities, thoughts, and feelings can reduce stress, anxiety, and even depression. If you’re a guy who’s had a tough time lately, maybe journaling can be the perfect stress ball for you. Keeping an everyday journal may also make you more eloquent and improve creativity. Writing imposes a need to capture thoughts and feelings in words, therefore, expanding your vocabulary. Of course, this is not an overnight thing. It takes long-term dedication and real effort. You may also be surprised at the benefits that journaling can have on your professional life. By tracking activities, events, and deadlines you’ll become more organized. Over time, this organization will transfer into self-discipline. The boss may even notice your new work ethic. If you are the boss, how about buying each of your workforce a journal? The final benefit we’d like to squeeze in before moving on is that writing about experiences can make you a more rational thinker. It can make you question your own behaviors and encourage you to handle situations differently. Clearly, all of this is beneficial to any man. Regardless of age, skin color, sexual orientation, or ethnicity. Why buy a men’s journal over a cheap Notebook? We agree that cheap doesn’t necessarily mean bad and expensive doesn’t mean better. However, there are a few reasons why the cheaper notebooks may come up short compared to quality journals. The first is to do with the quality of the paper. Some cheaper brands provide a thin paper that either damage easily or isn’t very opaque. Some cannot take pressure from some pens, such as sharp fountain pens. The best indicator of quality paper is its GSM rating. This tells you the paper’s weight and therefore its thickness. Another reason is the appearance. Some wallet-friendly notepads may be bound in cardboard or unsightly plastic featuring their company’s mascot bumble bee, crocodile or whatever else. However, the higher quality everyday journals for men look the part. There’s nothing nicer than carrying an antique-like or leather journal that looks as though it could’ve been owned by Samuel Pepys or even a pirate. Okay, that last one may just be our overthinking. What Men’s Journal Should I Get? The first question when you start to write a journal should really be: why go for a physical journal at all when there are apps and Google calendars free and convenient? We won’t deny that these technological alternatives can be really handy. However, you remember all those benefits we listed earlier? They either don’t count or aren’t as notable when typing. Research has shown that these benefits are way more significant when we get down to writing by hand. Of course, if you do some journaling in the park or at your local coffee shop, you’ll appear rather mysterious and alluring to passers-by and fellow cappuccino sippers. That could at least get a date or two, right? Now that we cleared that up, what are the best everyday journals for men? It will depend on what you intend to do with a journal. If you’re a businessman who wants to record upcoming meetings, deliveries, and conferences then a journal with lines, dates, and times already inserted will be best. If you haven’t yet pinned down a particular goal with your journaling, you may just go for some ordinary lined pages. Some people like to express their journaling with illustrations. Those men should hunt down journals without lines and quality paper to be their blank canvas. Some examples may help we feel. We made a list just for you. We hope you enjoy our 16 everyday journals for men that we feel will be perfect for you. The first everyday journal we have to show you is the Genuine Bonded Leather Journal from Markings by C.R. Gibson. 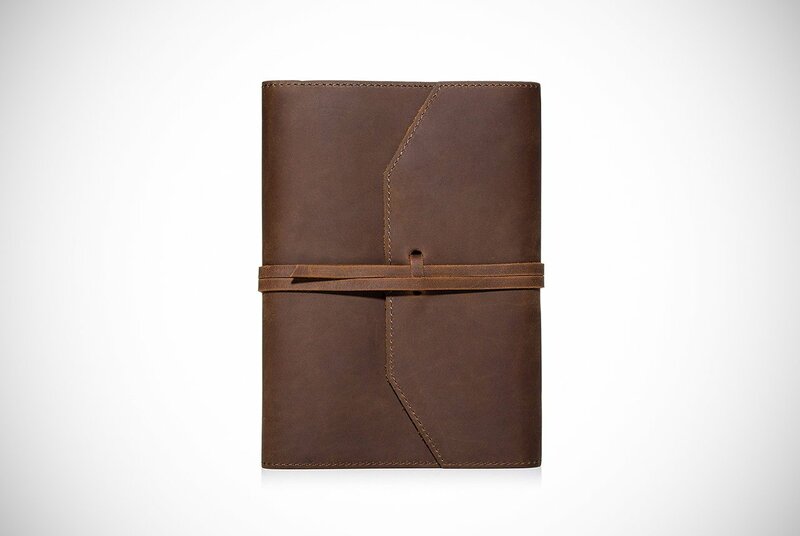 As the name suggests, these everyday journals for men are covered in genuine brown leather. There are some nice features of this men’s journal. That includes an elastic band to keep it shut and compact when not in use, and a ribbon-style bookmark for added convenience. The interior is made up of 120 double-sided, ivory-colored pages with 32 lines on each page. The paper makes use of soy inks and is lignin-free and acid-free too. At the back of the journal, you’ll find the last feature this journal has to offer. It has a backpack-like sleeve pocket to store notes, loose papers, and whatnot. This is a bit of an all-rounder journal but because of the pocket at the back. We envisage it being perfect for businessmen or students who need to transfer the day’s notes and Post-it reminders into one convenient place. 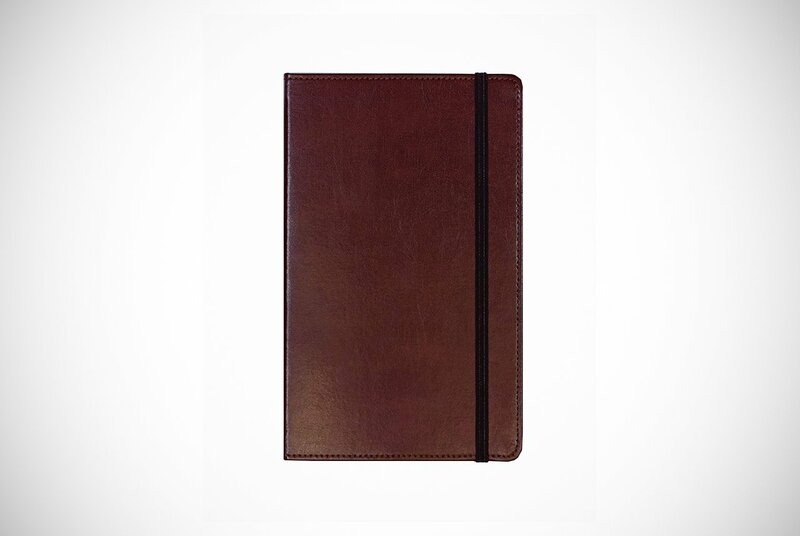 The Antique Handmade Leather-Bound Notepad by Moonster is as good as it sounds. In fact, we’ll stick our neck on the line and say this is probably one of if not the best-looking everyday journals for men on our list. It is wrapped in genuine buffalo leather with striking hand stitching down the spine. It offers an antique leather strap to keep it fastened. One of the most unique aspects of this journal is that due to being made of genuine leather. It is impossible for leather and fake leather to be exactly identical. Real leather will always differ slightly in its shades and markings. The inside is as good as the outside with double-sided pages of 125gsm paper. The paper is off-white in color, unlined, environmentally friendly, and of exceptional quality. No matter which pen, quill, or brush you use on these 240 blank canvases, you’ll be guaranteed no bleed through. We think this among the best everyday journals for men who want to use their journal for personal rather than professional use. If you’re an artist or love to scribble you prose without lines like your favorite nineteenth-century writer, then this is for you! Exceptionally looking journal – one of the best looking? The third notebook on our list changes the direction again and is one of the few that is not bound in leather. 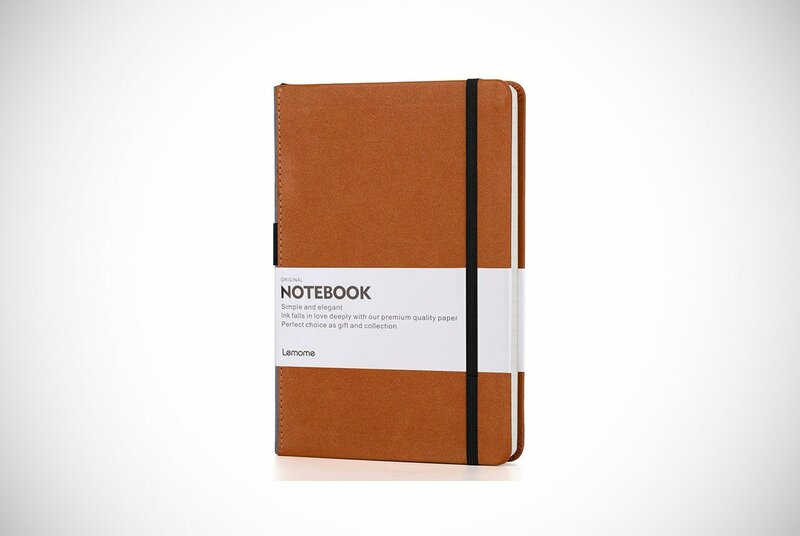 This Thick Classic Notepad from Lemome has a lot to offer. Its exterior is a hardcover type, just like a book that will keep your contents protected. Down the spine of the journal, you’ll find one of its key features, a loop to keep your pen for extra convenience. Inside you’ll find 180 high-quality lined pages which are suitable for all pens and inks. The paper is thick with 125gsm standard paper that will not allow bleed-throughs. At the back cover, there is a pocket similar to the one we discussed earlier. This is perfect for keeping other smaller or folded documents in a go-to location. We would recommend these everyday journals for men to the young men still in school. Mainly because one little perk this journal offers. It will lay flat and not tend to randomly close due to its design. This makes taking those lecture notes less distracting. Millennial men come this way! Next up is the love child of what has already been. This A5-sized Classic everyday journal has a lot of the features from the previous journals. First, the exterior is leather bound, has an elastic band closure, and a ribbon bookmark. It also comes with an adhesive pen holder. Moving inside, the paper is of satisfactory 100gsm quality. It might not be as good as some of the previous paper, but still capable of holding its own against many pen types. It is also acid-free and fluorescent-free to tick some guys’ environmentally friendly box. There is again a pocket on the back cover ideal for storing business cards and notes. We think these every journals for men as the perfect early adult journal. Not because we think men in their early 20’s should get one. It’s still a solid choice for a lot of men. The only men we would warn against it are guys wanting to add illustrations or use a wet fountain pen. There is a much better paper out there for these uses. Vegetarians, animal lovers, environmentalists, and vegans huddle up. These everyday journals for men suit your way of life and values perfectly. 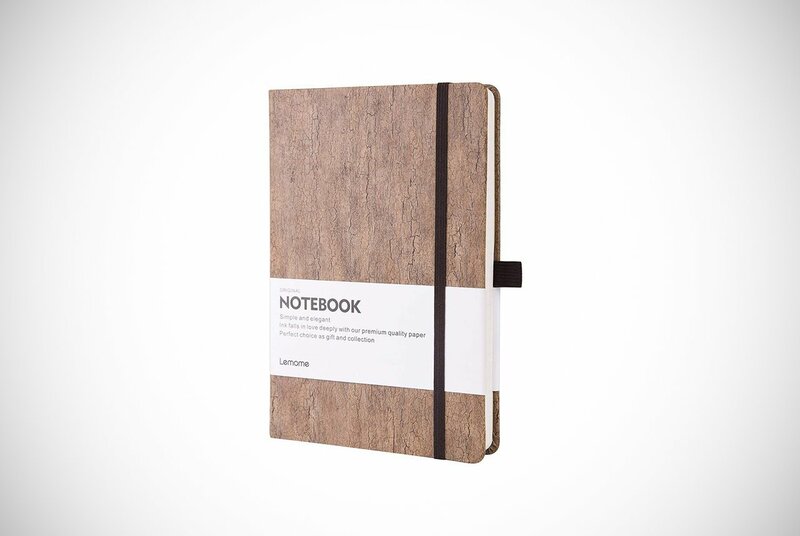 The Eco-Friendly Natural Cork Notebook is a must-have. It’s made from cork fiber, which may look like leather but is extremely environmentally friendly. A cork tree can live for as long as 300 years and in that time their bark can be harvested without damage. Obtaining the cork leaves a minuscule ecological footprint and none of the journal’s manufacturing process involves animals. If we do find a reading and writing pig, we’ll let you know though. The key selling point of this journal is definitely its material, but it has many of the other great features we’ve previously seen. That includes its ability to lay completely flat without paperweights, 120gsm and acid-free paper. It also offers a pen holder, an internal pocket, an elastic closure, and a ribbon for a bookmark. If you’re a guy who wants a journal while being mindful of the environment, look no further! 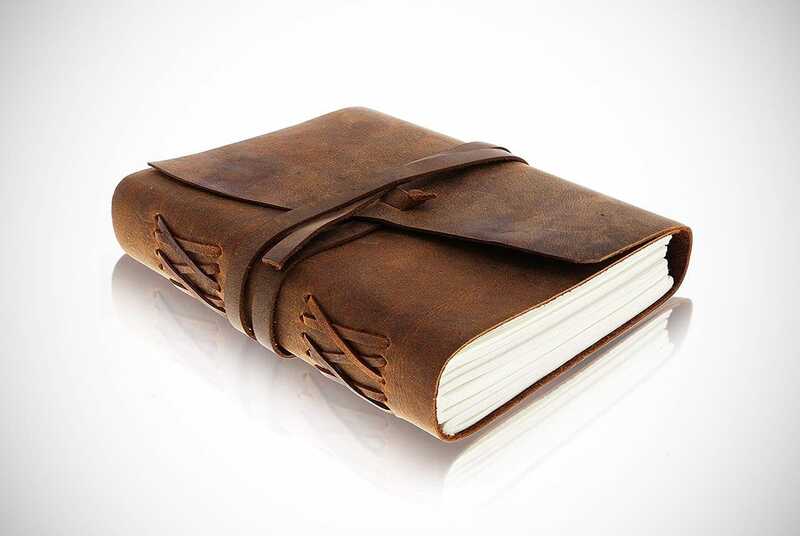 This handmade leather journal is another fantastic option for men. 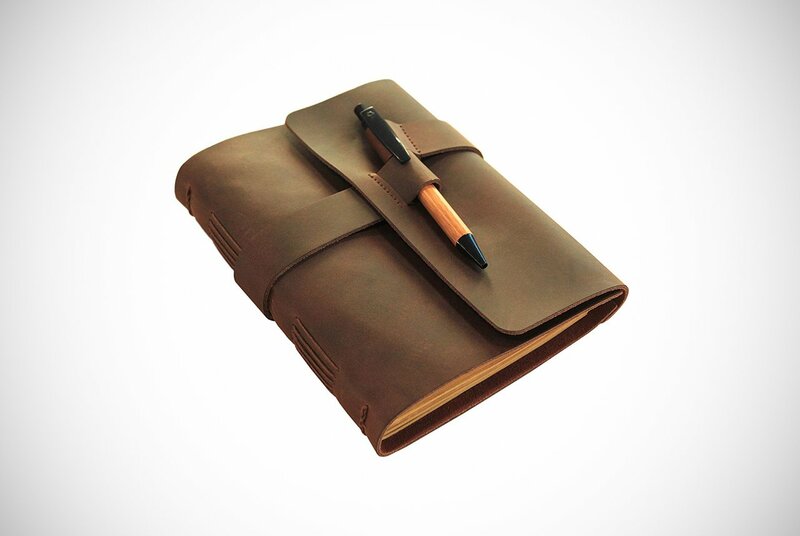 It’s wrapped in a genuine leather jacket so no two journals can be exactly the same. While the other elastic bands were vertical to keep everything compact, this journal uses a horizontal elastic band that may be a little more elegant. These everyday journals for men are supplied with three sets of 100gsm paper. Why three? Well, one of the best things about this journal is that it can be refilled. It comes with plain, lined, and graph paper. However, you can also order more of your favorite paper type through the same company when you’re done with your first batch. This could literally be your journal for life. Due to it being a refillable journal, this is aimed at men who want a long-standing product. The different refill paper options also widen the market for uses. Although, there does remain better paper out there for messier inks and artistic types. It may be the perfect gift for dad or a globe-trotting bro. The mountain journal looks like a journal straight from the hands of an adventurous but pensive hero from the set of a Hollywood movie. 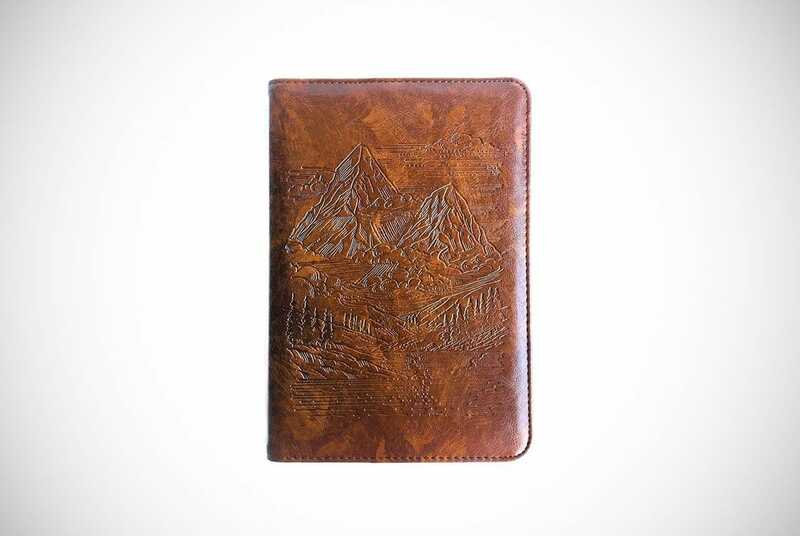 The embossed design of mountain peaks on the soft synthetic faux leather makes this an aesthetically pleasing and rustic journal. As the leather is synthetic and the product as a whole is cruelty-free, vegans can enjoy the mountains with this in their back pocket without any ethical burdens. What’s great is that this design can be enjoyed for as long as you want as this journal is another refillable one. You can choose your favorite type of paper to add once you’ve run out of space to record all your future adventures. The original paper and any paper you add from the same company is guaranteed to be of good quality. This helps to prevent bleed-through. One nice addition to these everyday journals for men are numbers to the pages. We aren’t sure if their replacement pages also come with these numbers. If you find out let us know. This doesn’t mean you’ll go without the standard ribbon bookmark. If you’re a nature-loving guy that enjoys weekend ventures and meditative thought on the edge of a waterfall, this will be right up your mountain! If you’ve been scrolling through our recommendations trying to hunt down a journal that would make a perfect gift, this Leather Journal with a Bamboo Pen is an exceptional option. One reason it’ll make for a great gift is that you can order it with laser engraving of initials into the leather. 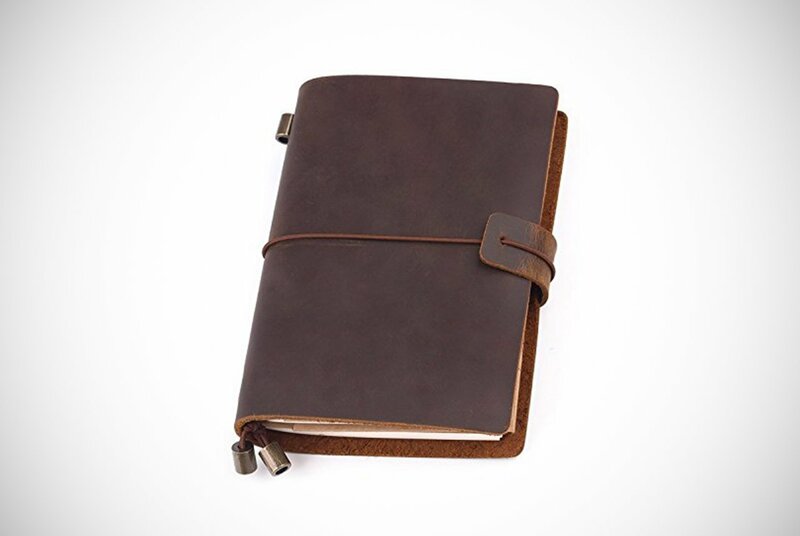 The exterior of this journal is made with authentic leather. What is really innovative is the locking method. To fasten this journal together, you place a pin through the holes of a leather strap that wraps around the leather bound. It really is an outstanding piece of design conception. When you open up the journal you’ll be greeted by 144 double-sided pages of artisan-type 80gsm paper. To be honest, the quality of the paper is a bit disappointing compared to other journals we’re featuring in this post. A bit like a mozzarella stick with no cheese. For that reason, this journal is the perfect male accessory for pencil artists or for men who like to look good with unique props. If you want to find proper everyday journals for men that you can write on outside as well as inside, we’re pleased to show you this journal by Sovereign-Gear. It is made from a soft leather that is tough, great smelling, and covered in special oils. These oils allow you to scratch and mark the outside of the journal into any rustic or antique design you desire. When you’re sick of your design, just give it a rub and you have a clean leather slate to go again. Some of the nice features on offer here are an internal pen holder that’s accompanied by a stylish pen upon purchase and a jute bookmark. When you turn the cover, you’ll discover 300 cream pages of plain paper. The manufacturers haven’t stated the paper gsm rating. However, they claim there will be no bleed through issues, so there shouldn’t be an issue. As long as you’re not set on lined paper, there’s no reason why this won’t be the ideal journal for any man. 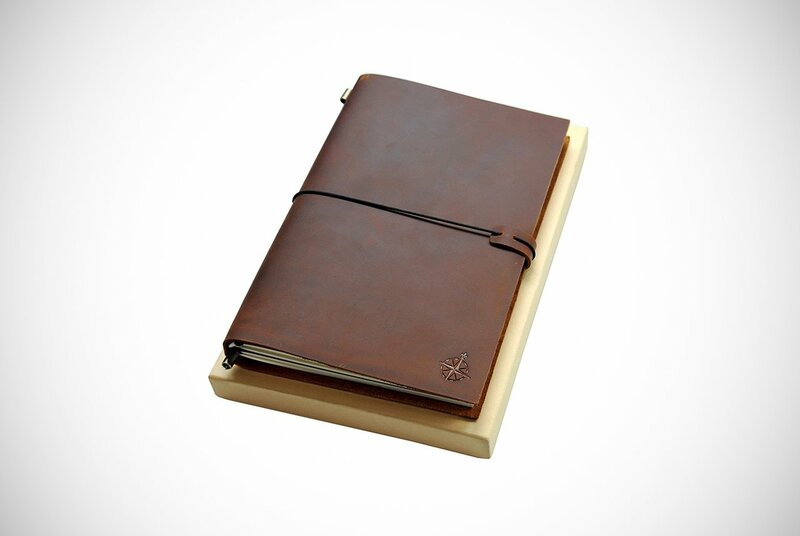 Next on our recommendations is this refillable journal bound with real leather. You can add either blank, lined, or kraft paper to suit different creative or scheduling needs in a smart and unique way. Its versatility makes it a great gift but the accompanying gift box it is supplied in makes it even more so. The journal closes with an elastic wire decorated with a quote engraved onto a small plate which will be seen as a nice touch to many. When you sit down to pen your thoughts you’ll be pleased to find 100gsm acid-free paper that will be suitable for most pens. An additional perk to this notebook we haven’t really seen is the inclusion of a PVC pouch. The pouch makes easy work of storing business cards, receipts, notes, and even tickets. Who’s this aimed at then? We’re pretty sure this one could be for any guy, but it may edge towards travelers or writers who like to record their daily observances ready for upcoming projects. 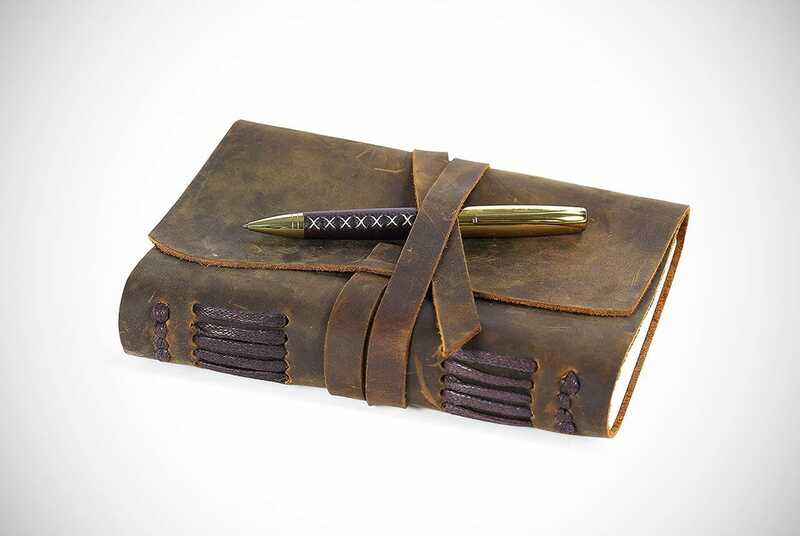 This handmade leather journal is another exceptional option. It isn’t trying to bring anything new to the quality journal game by offering standard features. The exterior leather is, in fact, genuine leather. This gives an authentic rustic look with attractive markings and slight differences of shade between two orders. Choosing one of these everyday journals for men may be the last journal you ever need to buy. Mostly, because it can be refilled with more A5 lined paper once you’ve finished recording notes, thoughts, events, or planning the structure of your next novel. Other features that are a nice addition to the journal include a ribbon bookmark, lay flat design for a struggle-free writing session, and internal pockets. 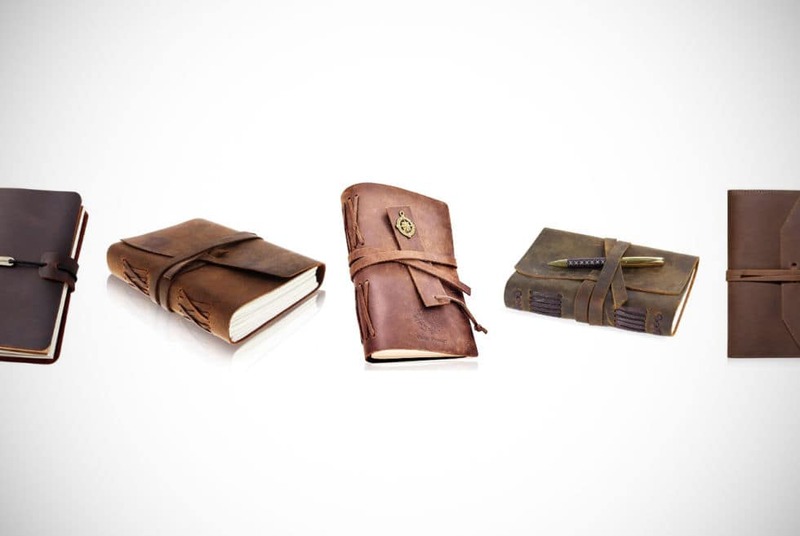 There have been reports that the leather strap used to tie the journal together can be a bit messy when writing on a desk and maybe inconveniently positioned in the same spot as your hand or arm. This can be a bit of a negative for it, but there are still so many good features that help us overlook it. At Men’s Gear, it was unanimously decided this journal may be better for luxury diary-type journaling. This is due to its design, quality lined paper, and easy refill. If you came here looking for a gift then this may be a great option. This is due to a discount when you buy two, so there’s no reason not to get one for yourself too! This leather journal is both aesthetic and practical. It’s made with crazy horse leather to give a natural and distressed appearance, bound to turn heads across the café or for your own pleasure at home. 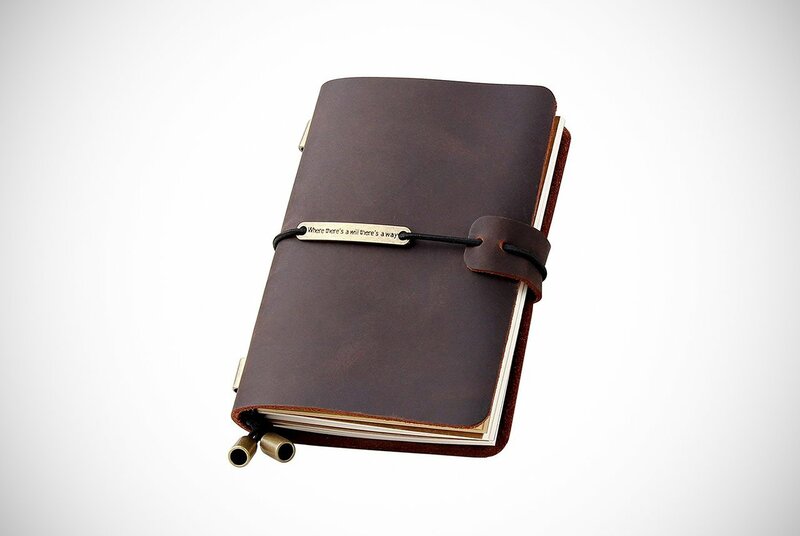 The journal is tied together with a cool leather strap which is also held in place by a pen that is inserted through a pen holder on the front cover. Obviously, you get the pen as well! When you unwrap the journal, you’ll find 100gsm unlined paper for you to sketch, doodle, or make linguistic melodies. Once your paper is coming to an end, simply get back online and order a new batch. It can effortlessly be inserted into the journal as though you just bought it again. Some other cool nice touches include a lay-flat binding and a small business-card size internal pocket. 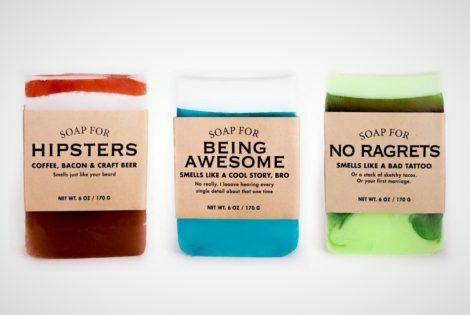 These are clearly solid everyday journals for men all over the world. Sometimes, we don’t want a refillable journal. If you’ve been traveling and want an item to remember all the little parts of your adventure, a completed journal is the token item. This could be the personal memorabilia to get out dinner parties or at family occasions to reminisce about your trip. If you’re getting it out to show friends, then you’ll want a standout journal. These everyday journals for men are just that! The journal has crazy horse leather binding with a leather bookmark crested with golden compass markings. 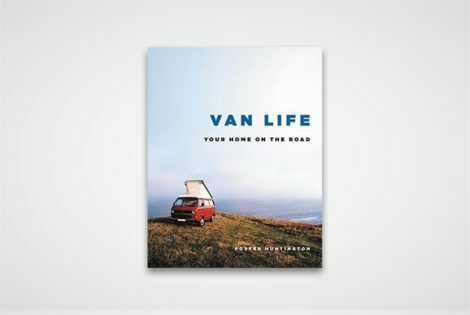 Turning the front cover, you’ll find the quote “make today an adventure” followed by 90 double-sided 120gsm blank pages. If you’re a travel blogger, you may not always have a device or internet connection. This may be your in-between method of taking notes before setting up camp back home. Once there, you can tell the world your amazing stories and recommendations. This journal comes with a free eBook which is related to journaling and writing. This is great if you’re new to this fine art and want some tips. It’s a great bonus gift for sure. 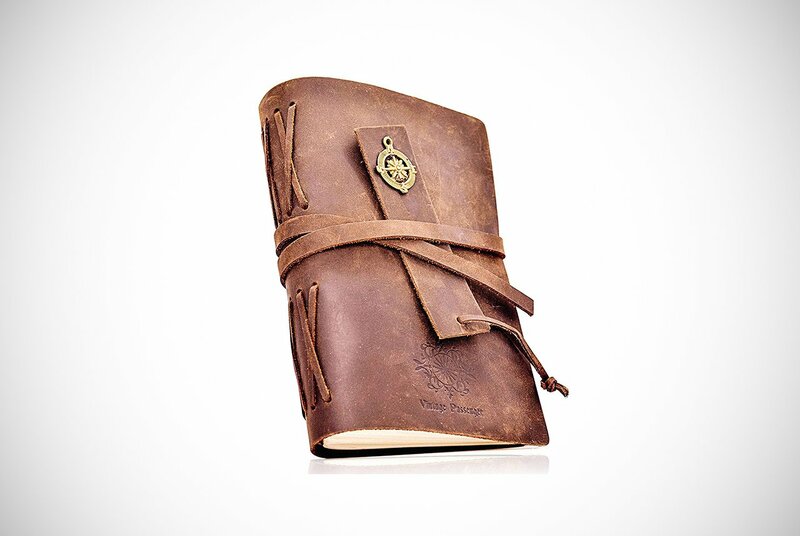 Ultimately, the design and the aura of this journal has a traveling guy’s name all over it. 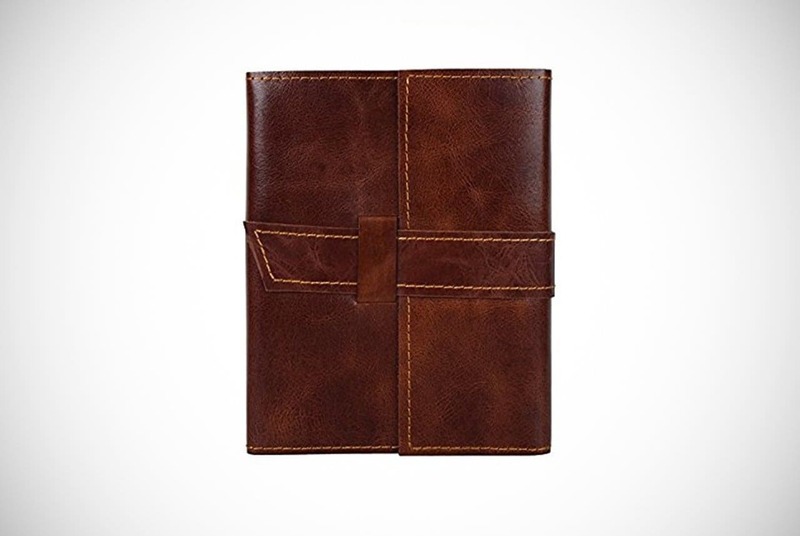 This is another traveling-type journal but with less ruggedness and a bit more streamlined. This journal might be in the hands of a sunbather on a faraway beach. They may have interesting compass markings etched into their cover and in this case, at the corner of every page. You could make it a bit rougher if you like as you can add your own leather markings to this crazy horse leather-bound journal. You can also rub-away if desired. These everyday journals for men are refillable, and you can use it for each annual trip or expedition. Be sure you refill with 120gsm quality paper if you want to keep using fountain pens or even paintbrushes inside this outstanding product. 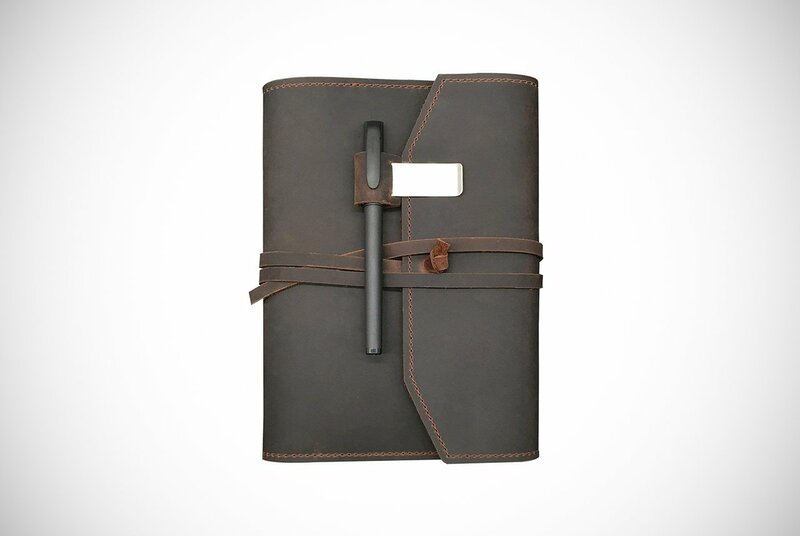 While this is also a leather journal, it is slightly different. The other products have mostly had some sort of rustic charm but this one has a modern feel to it. You wouldn’t get strange looks to even suspect it looked wallet-like. The leather-bound has some stand out lighter stitching across all its edges. This makes it sleeker and more modern than it is rustic or charming. Exact quality and weight of the paper has been left out by the manufacturers. However, many people have testified to its ability to not cause a bleed through when used with fountain pens. The paper is acid-free and made from a cotton biomass. If you like these everyday journals for men but end up not liking the paper, it won’t be a big loss. You can easily refill it via online suppliers. We think the modern feel from this leather makes it a city hunter or urban dweller’s journal rather than a remote explorer. Just try not to take it out every time you go to pay for your flat white. What’s the gsm rating, RusticTown? One best everyday journals for men is this stunning Tree of Life Journal by Moonster. It was not under any doubt at our Men’s Gear headquarters. 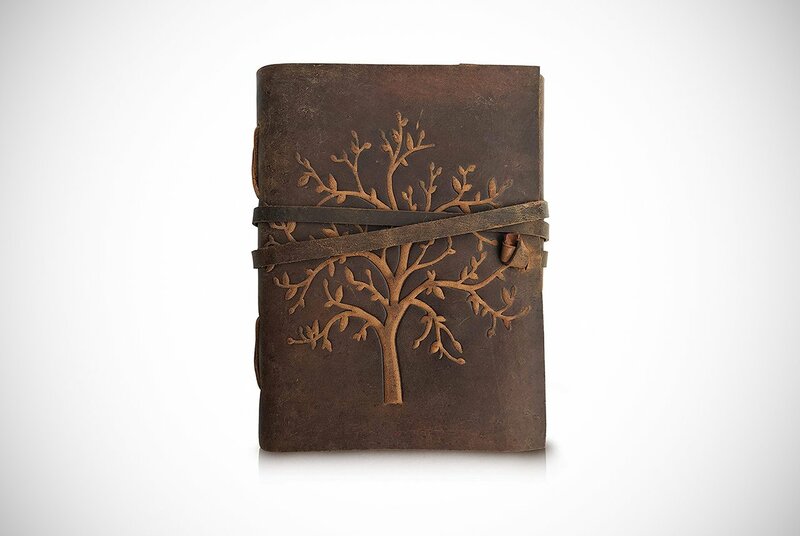 If you’re an environmentalist or a guy who typically looks out for the planet, this journal and its tree of life embossing is likely to catch your eye. Its leather takes us back to a rustic and charming design that looks as though it could have been used in some of our favorite Netflix series. Behind the tree are 120 double-sided sheets of off-white paper that have been manufactured using recycled cotton. This journal shows you can be considerate of the environment and still produce outstanding 125gsm paper. The green ethos of this journal is matched with some philanthropy too. This company even donate some of their profits to a child cruelty prevention organization in Africa. For these reasons and the quality of paper, we recommend this journal for any guy and any use! Well, that’s that. We’ve had the pleasure of guiding you guys through the best journals for men out at the moment. Many of these everyday journals for men are made with leather. Of course, not all of them. However, it pays to really seek the type of leather used and see for yourself the aesthetic appeal this adds to the product. Make sure you ask yourself the fundamental questions we ran through earlier before choosing your journal. There is by no means a one-size-fits-all approach to journaling. Many have slightly different features or are better gifts than others. We hope you’ve seen something you like and we hope you all ditch your Google calendars in favor of personal growth through a journal in the near future! 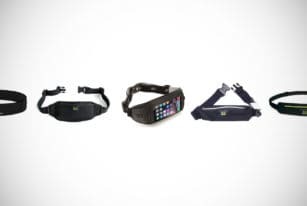 Running belts are the must-have companion on any road run, woodland trail or marathon to make sure your water bottle, smartphone and whatever else is always close by.